If you are a national of a country under the CEF procedure and you are not yet in France, you must address to Campus France of your country of origin. For information, the countries subject to the CEF procedure are the followings : Algeria, Argentina, Benin, Brazil, Burkina Faso, Cameroon, Chile, China, Colombia, Comoros, Congo, Brazzaville, South Korea, Ivory Coast, Egypt, United States, Gabon, Guinea, India, Indonesia, Iran, Japan, Lebanon, Madagascar, Mali, Morocco, Mauritius, Mauritania, Mexico, Peru, Senegal, Russia, Syria, Taiwan, Togo, Tunisia, Turkey, Vietnam. 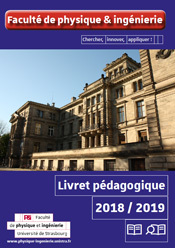 Applications received through the Campus France platform will be processed by dedicated pedagogical committees. In all other cases, applications must be made through the Ecandidat application website. When opening the Ecandidat platform, you will find all the necessary informations to submit your application. The application platforms are now closed. Once you have been admitted to one of our masters, you must register. The latter is personal and takes place in two stages : administrative registration and educational registration. You will find useful information on the CVEC on the CROUS website here. The Administrative Registration is done online after obtaining the CVEC certificate : administrative registration in M1 are from 5 July to 21 July ; administrative registration in L2, L3, LP, M2 are from July 23 to September 30. You can consult the UNISTRA website for further informations : here. At the top right of the page, under "university registration", click on IAPRIMO if you are new to UNISTRA or IAREINS if you are already registered with UNISTRA. The section PJWEB is used to put the required supporting documents. The administrative registration ​​on smartphone or tablet is strongly discouraged. Under certain conditions, international students are entitled to financial aid from the CROUS (the regional organisation in charge of student facilities and support) or the French government. Click here.